Tyrant Designs CNC , an industry leader in high-end aftermarket AR grips is only a few weeks away from releasing their first ever AR vertical grip! So far they are only calling it the Mini Vert Grip. The dimensions are roughly 3” L x .8” W and is directly compatible with M-LOK and KeyMod. The 3” in length is almost an inch shorter than most vertical grips, Tyrant instead utilizing an elongated lip at the bottom, allowing the operator the option of either tucking their pinky behind, or resting the finger on top. It is said to weigh around 2 ounces, but no official number has been recorded. Tyrant Designs also mentioned that this will be their most affordable product to date, and the price point will be very competitive with other vertical grips. Tyrant Designs CNC is an AR accessories manufacturer based just outside of Chicago. They have had several successful designs for AR pistol grips and are releasing their line of vertical grips and handstops next month. The Blitzkrieg Components AR-15 Chevron Front Sight Post (FSP) with white contrast stripe is a great upgrade to any AR-15. 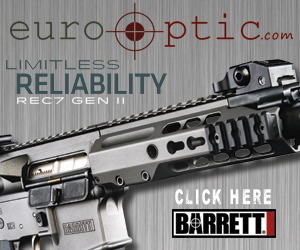 With the included proprietary front sight tool, installation and adjustments are an easy task. The recessed white stripe chevron makes for very fast sight picture acquisition and offers a great reference for those who sometimes confuse the protective wings of the front sight housing as the FSP. Sight adjustments are limited to every two clicks with the white chevron on both sides, though only two of the four sides are used for sighting, it will be twice as accurate as a single-sided sight while obtaining a precise zero. The Blitzkrieg Components Chevron FSP is machined from a single piece of billet 416 stainless steel and is coated in a melonite matte black finish. I have successfully installed the chevron FSP in a Diamondhead-USA DIAMOND front BUIS, a Magpul MBUS front sight, a Samson Manufacturing front sight and a standard A2 front sight base. It will fit almost any AR-15 front sight housing, though Blitzkreig Cmponents advises that their chevron FSP is not compatible with the Magpul MBUS Pro or the LWRC Skirmish sights. Zeroing in my AR with the Blitzkrieg Components Chevron FSP was just as easy as any standard FSP and any noticeable difference in obtaining a realistic zero with every two clicks was negligible compared to one click adjustments. Additionally Blitzkrieg Components also offers a black chevron FSP without the white stripe marking for those who opt not to have the bright white feature on the front sight. Personally, I prefer the white stripe as it offers higher contrast and a faster sight picture. Engineering wise, I am not sure if it would be possible or even feasible to create a four-sided white stripe chevron FSP that would offer the chevron post on all sides. If that were to be done, it would offer more capabilities for sight adjustment, however the chevron would probably need to be canted at an angle towards the target, and the shape of the sight would be more in line with that of a pyramid. I would be interested to see if that was possible, and if it were to be as effective or if the sight being angled away from the shooter would cause any issues with sight acquisition, or precision. Even against a bright background, the Blitzkreig Components Chevron FSP offers enough contrast to obtain good sight acquisition. Anyone who has spent any time in the military or who has had even an itch of survival skills has heard of or used Paracord (aka 550 cord). A new company has entered the scene, Tricorne, which is named after the three cornered hat worn by the patriots that founded our great nation. The fine folks at Tricorne have created the “Spool Tool” (Patent Pending) which is, per their webpage, “a device that is used for storing, cutting, measuring, and finishing Paracord and other rope, cord, line, string, and twine.” The “Spool Tool” is 100% made in the U.S.A. and Tricorne is an LLC based out of San Diego, CA and is a veteran owned and family operated business. My first thought of the “Spool Tool” was, why didn’t they have this when I was in the military? My second thought was, why didn’t I think of this? The spool itself feels virtually indestructible and though simple in function, it is well thought out and designed. The razor blade, though it will last a lot longer than the 50′ of paracord will, was extremely simple to replace. Two screws that are attached to the spool via a small nut on the reverse side are all it takes to remove the cover and to reattach once the blade has been changed out. From what I understand, the BIC lighter will not be included with the Spool Tool when shipping is required, though it may be included when it is offered for sale in stores. At a cost of around $1 and found for sale virtually everywhere you can pick up a pack of smokes, it is a moot point whether or not the lighter is included. And if you are worried that the lighter’s “button” will be pressed while in your bag, don’t fret, Tricorne has already thought of that and has included a tab that blocks any inadvertent attempts to lose all of your lighter fluid. For such a simplistic piece of equipment, the Spool Tool offers a big bang for your buck for what your receive. Tricorne now offers multiple color variations of not only the paracord, but the Spool Tool also comes in black, coyote, orange and blue. Spool Tool’s are available for purchase on their webpage and you can follow them on Facebook as well. The MagPod is an aftermarket PMAG floor plate replacement that allows you to turn your magazine effectively into a monopod. Get it? MAGazine + monoPOD = MagPod. The installation of the MagPod is extremely simple to install on any Generation 2 or older Magpul PMAG or EMAG, but not possible on the newer Magpul M3 PMAG, which was initially frustrating to install upon (non-existent) as I didn’t get the memo of the latter. The front edge of the MagPod allows a forward lean of the rifle and provides enough real estate against the ground to prevent an uneven feeling or sideways wobble. The bottom dimple-looking pad, which is made out of an unknown rubberesque material provides a good less-slip surface. I say less-slip and not non-slip because with enough forward force, nearly any surface will slip, so I do not want to be misleading. I appreciate the feature of the front “leg” of the base pad and how it is hollowed out on the sides. Intentional in engineering or not, the hollowed out sides not only reduce the weight of the MagPod, but afford the user some leverage to get their meat hooks onto while drawing the magazine from a pouch. Though there is no technical data or a completed webpage to reference right now on the specifics of the MagPod, their Facebook page has been providing some insight into the process that has been in the works for a few years. Below is an image of an earlier prototype of the MagPod that I took back at the 2013 SHOT Show. Notice the change in the forward “leg” padding? Though there has been some heartburn over MagPod’s release date being pushed back, I think that the difference in the forward pad should be worth the wait. Manufacturers can update, modify, and change a product 1,000 times after it is released and customers have complained on why they didn’t like a product or why they will never buy from that company again. That same manufacturer only gets one chance to release its product to the world and to ensure it is right before it goes out is admirable. We would have a hell of a lot less recalls and warranty problems if more companies took this stance. So for those of you who have been patiently awaiting the MagPod to hit the stores, your long wait may be coming to a close. As of a Facebook post from a few days ago, their latest release date is looking to be around the beginning of September 2014. I hope that date holds true as it would be nice to be able to pick up a few more. Blade-Tech, a company who is well known for their handgun, Taser, and accessory holsters, also produce many other great products for the gunfighter, trainer, or weekend shooter. One of those products is their training barrel, which were developed exclusively for the professional LE/MIL and Civilian Firearms Training Industry. When I was searching for a training option for building clearing, non-firing movement drills, and introducing new shooters to a firearm, I had considered purchasing a blue/red gun. Though the blue/red guns have their place in training, they do not offer the realistic feel and function of a real firearm. In reality a blue/red gun is a chunk of plastic that is molded to simulate what a specific handgun looks like. Blue/Red guns do not have the functionality of a true firearm and obviously do not have the same feel with weight and texture. If you are going to train, train realistically. If your handgun has a safety, shouldn’t you practice disengaging and reengaging the safety throughout your training sessions? Aside from wanting a training option for what has previously been mentioned, one of my training rituals is “dry-fire” practice. It should be in every shooters ritual. Prior to “dry-fire” drills, the individual performing the drill shall ensure that a magazine is not inserted into the handgun and both visually and physically check that their handgun’s chamber is clear of any ammunition. Once the handgun is determined to be clear, the individual should ensure that they do not have any sources of ammunition on their person, or around their training area. Once all of these tasks have been completed, the individual conducting the “dry-fire” practice should ensure that they point their weapon in a safe direction and not to point their handgun at anything that they are not willing to destroy. I could go on and on about how many checks and balances are needed when ensuring your handgun is clear, having it pointed in a safe direction, etc. However, time after time I hear about someone performing “dry-fire” practice and even after they think that they have mitigated any possibilities that their weapon will not fire, they still end up shooting something (TV, cat, wall, loved one, etc.) either during or directly after the training session. Enter the solution. As long as you are capable of field stripping your handgun to the point of being able to remove the barrel and correctly putting it back together, you have the capability of switching out your “functional” barrel for a “training” barrel. The Blade-Tech Training Barrel is made out of a strong yellow impact-resistant material that will resist harsh chemicals and withstand intense training scenarios. The Training Barrel has a solid core which will not allow ammunition to inadvertently be chambered. And with its bright yellow appearance, there is no mistaking to you and to others around you that the weapon is completely safe and incapable of firing. However, while handling your handgun with the Training Barrel in place, you should still treat your handgun as if it were loaded and continue to only point it in a safe direction. Also, aside from the inability to actually fire ammunition out of the barrel, or performing full malfunction clearance drills (with ammunition), the Training Barrels allow you to have full functionality of your handgun to include racking the slide and performing Primary Malfunction Clearance drills (Tap, Rack and Roll, Assess). The benefits of the Training Barrel far outweigh the drawbacks when using this barrel. Honestly, the only drawback to using the Training Barrel is having to field strip your handgun to replace the barrel. Depending on what type of handgun you are using, this could be negligible. Breaking my 1911 down takes me a little bit more time than my Glock, which I can have broken down and reassembled in just under 30 seconds. In all I own three Training Barrels, one for my Glock 21, one for my Glock 19, and one for my Colt 1911 platform. At a cost of around $13.99 each, it is very reasonable to have one for each handgun owned. If I were to purchase a blue gun for each of the three handguns I have Training Barrels for, it would have cost me around $144.00 instead of around $42. Available for the following handguns: 1911 (Commander/Full Size/Officer), FN (P9/P40/P45), Glock (17/19/20/21/22/23/31/32), Kimber Custom TLE, Para Ord (12/13/14/16) , S&W M&P (9/40), Sig (220/220R/226/228/229), and the Springfield (XD40/XDM40). Click HERE for more information on the Blade-Tech webpage. Midwest Industries (MI) is excited to announce many new products for 2014. First, MI has released the MI-SSK 12-inch Key-Mod rail. The 12-inch MI-SSK is built out of 6061 aluminum and weighs in at 8.5 ounces. This very lightweight rail uses a proprietary barrel nut wrench that can be affixed with a standard barrel nut wrench. The rail comes with 5 QD sockets located on the front and rear of the side rails and one located on the front section of the bottom rail. The MI-SSK will also come in 9, 10.5, and 15-inch length rails. The MI-SSK (12-inch model) will retail for $289.95. MI also introduced what appears to be probably the first available Key-Mod handguard available for the IWI Tavor, offering 10 Key-Mod slots on each side of the handguard and an interchangeable front plate that can be replaced with a plate that will accept a 1-inch flashlight to house the light internally and will need a pressure pad to be operated. The Tavor handguard will be available in February. MI is also offering in 2014 a carbine length drop-in Key-Mod rail, a billet AR-15 receiver set, and scope rings and mounts. For more information visit, midwestindustriesinc.com. New for Mossie Tactics in 2014 is their new UQDL (Universal Quick Detach Loop). The UQDL allows for multiple mounting locations on multiple weapon systems by placing a coated wire loop through available locations around the weapon system where a typical rail mounted QD socket is not available. The QD socket is built from 6061-T6 aluminum and is anti-rotational. The UQDL retails for $24.95. For more information visit, mossietactics.com.